Sorry for the confusion above; you’re looking at the official plant genus and variety, followed by the required plant patent numbers. What we’re talking about is the Bloomerang lilac, a new introduction by Proven Winners®. And she’s a beauty. Among shrubs, lilacs are the spring divas of USDA Zones 2-6, meaning more than half the country. That they don’t perform well in warmer climates is due to their need for cold temperatures in winter, and the colder, the better. Anyone who grew up north of the Mason Dixon line can close their eyes right now and conjure up the sweet perfume of lilacs in the spring, for they are among the most fragrant (as well as floriferous) shrubs grown in North America. Plus, lilacs are deer-resistant (meaning they are among the last things deer will eat when really, really hungry). Bloomerang is a winner for two reasons. 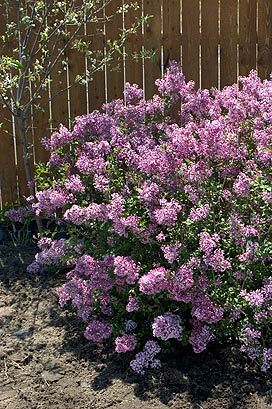 It’s a dwarf, relative to most other lilacs, achieving a polite height of 4-5’ with equal spread. Most important, it reblooms, thus solving the conundrum of devoting space to a shrub that will knock you out for two to three weeks in spring then offer not much else aesthetically for the rest of the season. Lilacs prefer well-drained soil and full sun. Fertilize once in spring with a slow-release fertilizer. Bloomerang is a powerful engine of stem, foliage and bloom growth all season long, so keep up a regimen of weekly watering throughout the season, particularly in the heat spells. Deadheading the initial spring blooms after they fade will aid in rebloom, as will deadheading throughout the season. The nice thing about Bloomerang is its compact height; you don’t need a ladder to deadhead and shape the thing. Bloom may slow down or cease during the peak heat of mid-summer, but the plant will start blooming again as the weather cools. I spied one last week still producing new blooms, meaning it was showing some nice bloom color on Halloween. The smaller stature makes Bloomerang an easy choice for foundation beds, property lines, and as a terrific accent shrub in front of evergreens. The plant is not without controversy— Maclean’s, a popular Canadian magazine, published an article not long ago decrying the nursery industry for developing reblooming lilacs, thus disrupting their sacred place as a spring-only joy and wonder. I side with the industry on this one, and say, with lilacs, reblooming is a fine thing. Lilac foliage is unremarkable, and they offer zero fall foliage change and color. They’re also not much to look at in winter. Granting them the ability to bloom spring through fall greatly increases their value.